Jon approached us with a requirement for a patio canopy to cover his patio area at the rear of his property. Jon enjoys entertaining and spending as much time as possible outside with family and friends. Aesthetics were very important… The ‘Ultimate’ canopy was the ideal choice. Due to the property featuring a contemporary wide patio, we wanted to make the most space available. We had to be mindful of the neighboring residents as Jon did not want an ugly looking canopy that would appear intrusive. We could use cranked posts to avoid soffits and gutters to make the canopy fit perfectly. The patio canopy drawings were signed off and Jon chose to have the structure powder coated in RAL 9005, Jet Black, which would provide a contemporary look to Jon’s property. He chose clear polycarbonate for the roof, which would allow the maximum light transmission to the windows, doors, and dining area beneath. 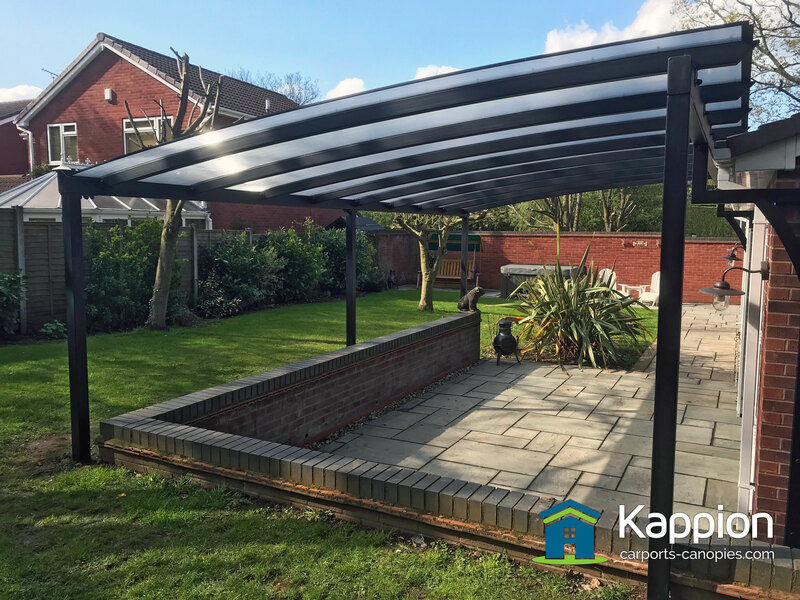 Once a manufactured date had been confirmed, the installation team arranged a suitable date for the garden patio canopy to be delivered and erected. Once installation started, the canopy took shape quite quickly and by the end of the first day, the structure was bolted together, glazed with polycarbonate and secured in the ground. Jon was extremely satisfied with the end result and we were proud to deliver a safe, high-quality product, at an affordable price. Thinking about purchasing a carport canopy? If you would like more information please get in touch. If you would like to request an estimate please use our Get a Quote! enquiry page.